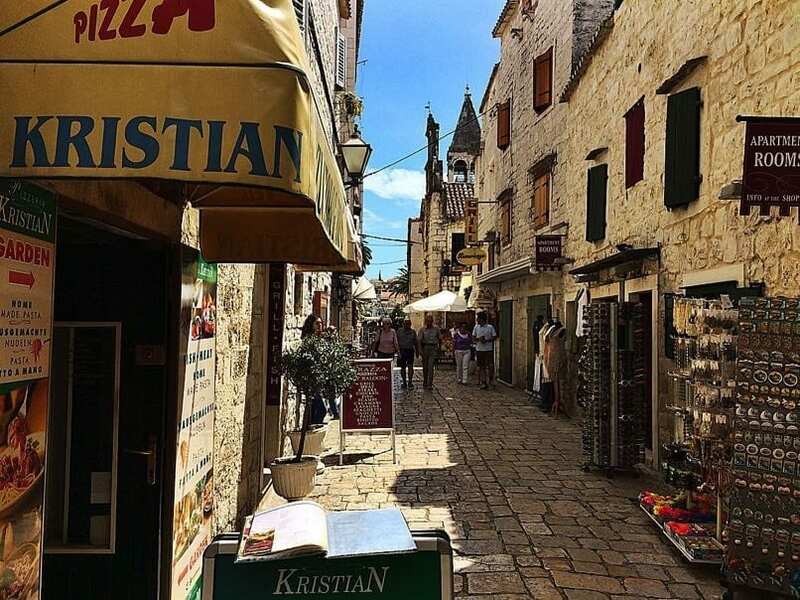 Trogir in Croatia was voted best city-island in the world by National Geographic in 2015 and a is a place that is definitely worth visiting especially as it is so conveniently located between Zadar and Split. 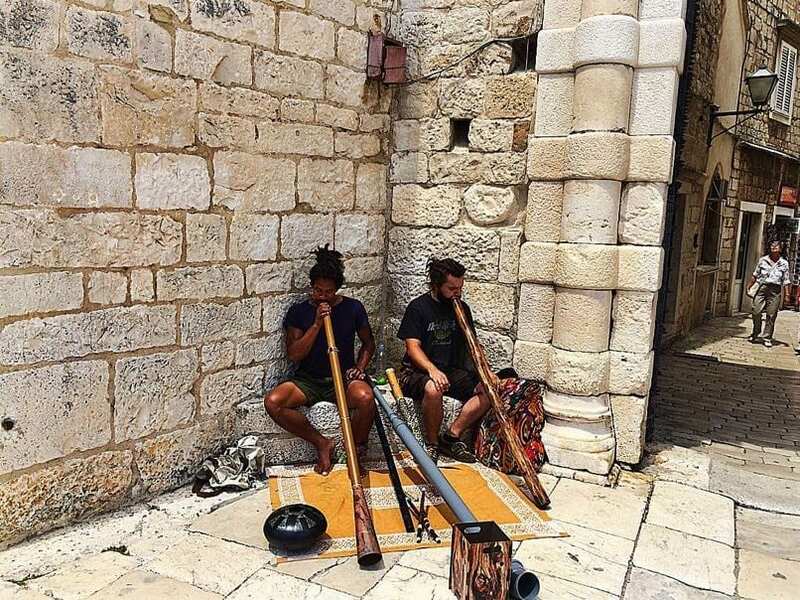 It is also a UNESCO World Heritage Site and has been since 1997. 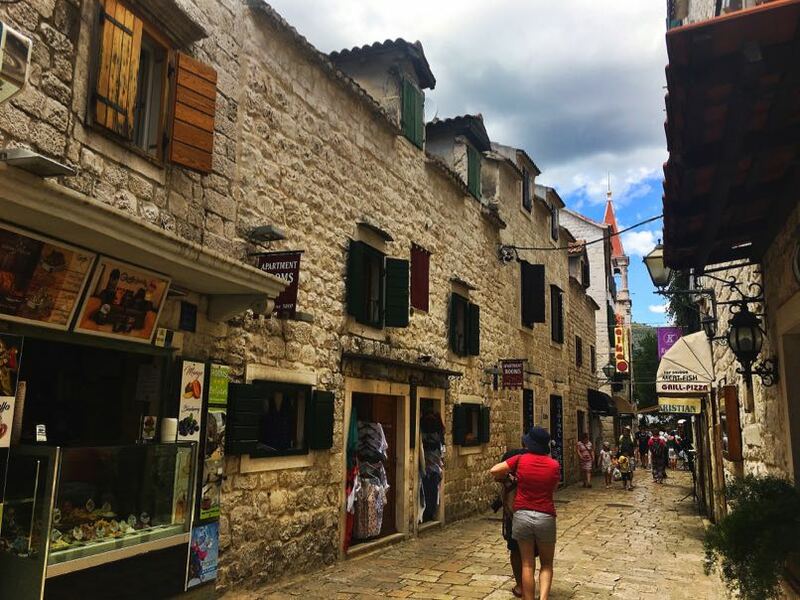 It is along with Dubrovnik and Sibenik a filming location of many films including Game of Thrones. One day is enough time to explore this small town, dating from the 3rd century, by foot but longer and you could explore the nearby beaches. Personally, it’s a place I would base myself and visit other places from as it is much less crowded. The Old town is protected by medieval walls and is situated on the islet between the mainland and Ciovo island. Its connected to both with a bridge. 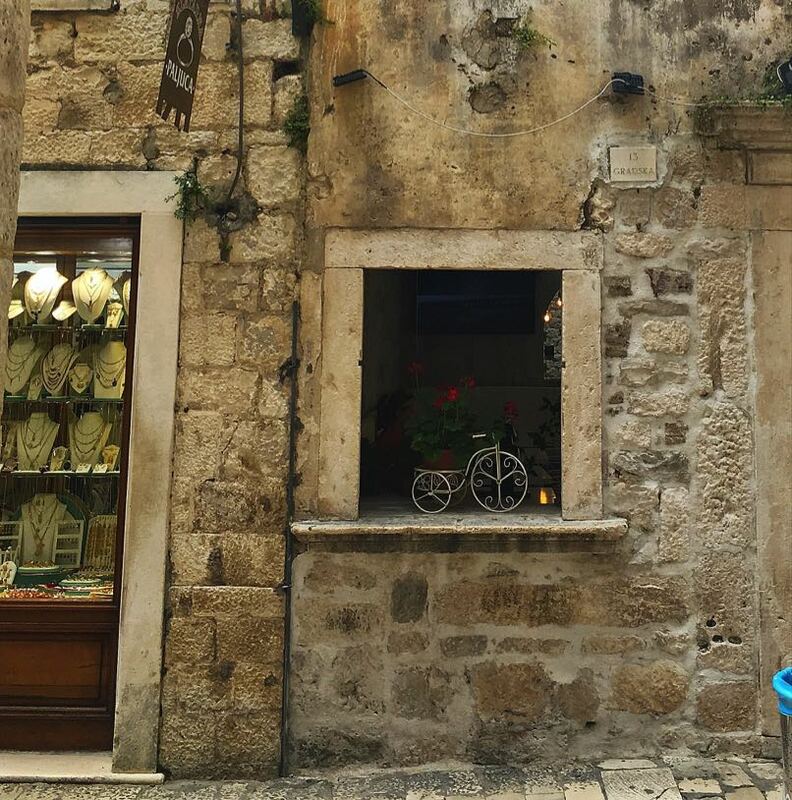 It’s a lovely little town ideal for leisurely wandering around, and exploring all the narrow alleyways and streets. 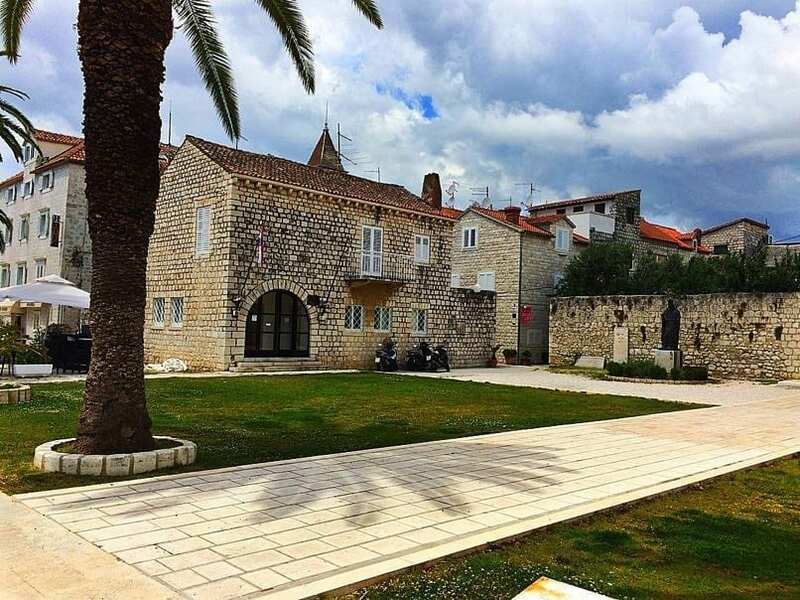 We stayed at The Belvedere Apartments and Camping site in Seget which is about 5 kilometres out of Trogir. 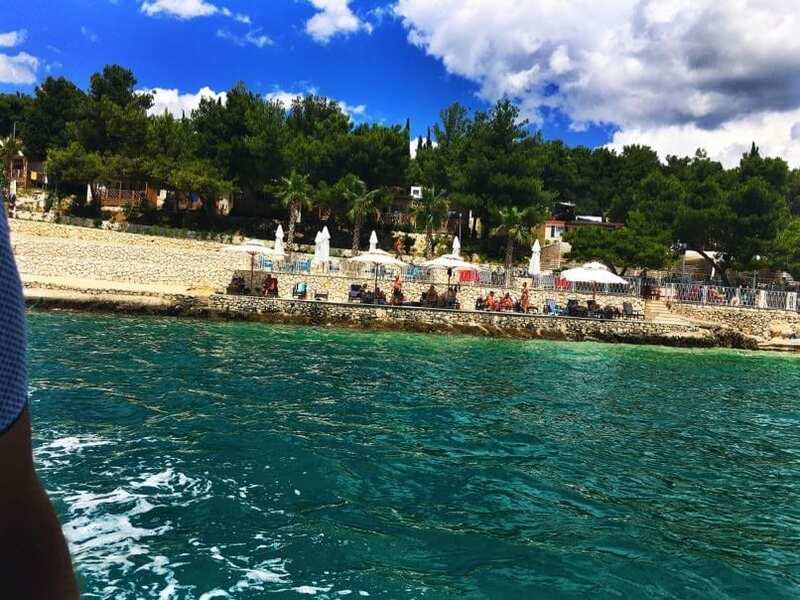 What we loved about staying here, as well as the beautiful sea view from our pitch is that they run a water bus every hour from the campsite to Trogir. The journey is 30 minutes and the cost is 50 kunas each return. We loved travelling in by boat and found it so refreshing on a hot day having the lovely cool sea breeze. It was much better than getting on a hot stuffy bus. 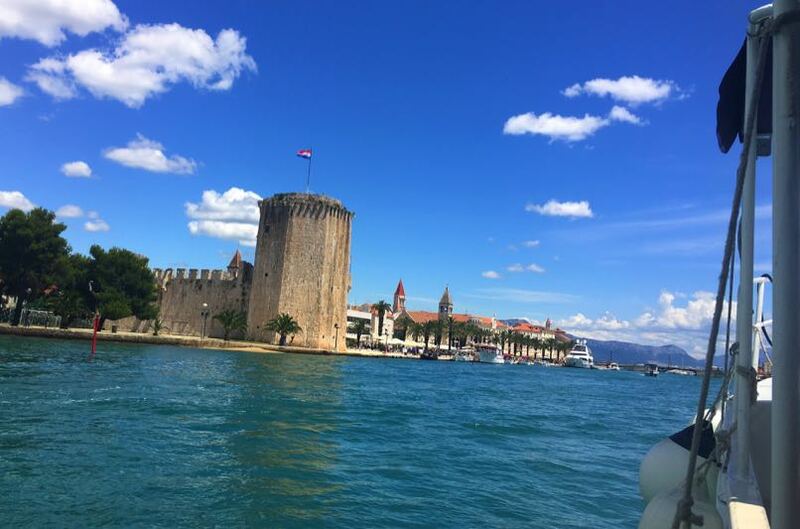 The first thing you see as you approach the town of Trogir from the sea is the impressive Kamerlango fortress sitting on the promenade. It is 14th century and was built by the Republic of Venice to protect the city. You can walk to the top of the fortress walls and enjoy the beautiful views of the harbour and the distant mountain ranges. From within these walls is a large open space where various concerts and events are held throughout the year. The waterfront promenade, locally known as Riva is lovely and wide with a line of palm trees along the water’s edge. There are plenty of restaurants and bars on the other side which looks out to expensive yachts and catamarans docked in the sparkling water. 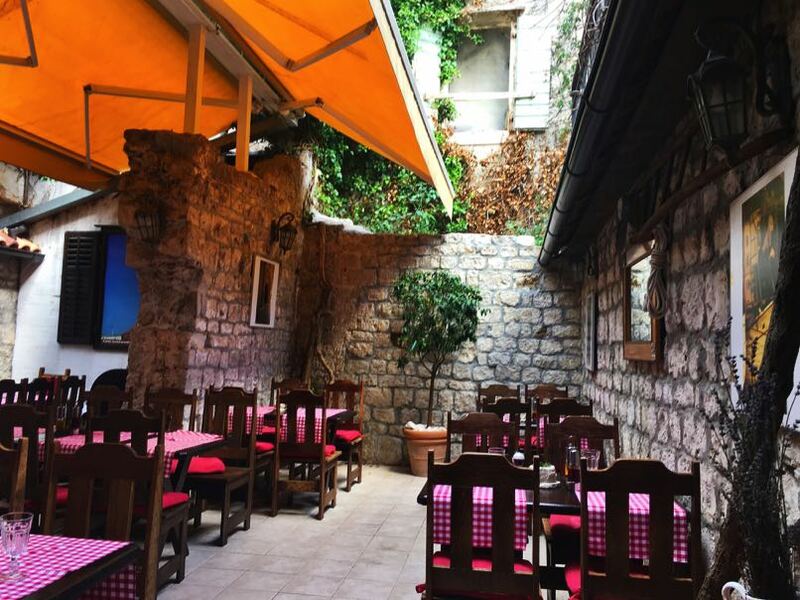 It’s the perfect place for a stroll, people watching, drinking and eating. The place is buzzing of an evening. In the background are the blue-grey mountain ranges. 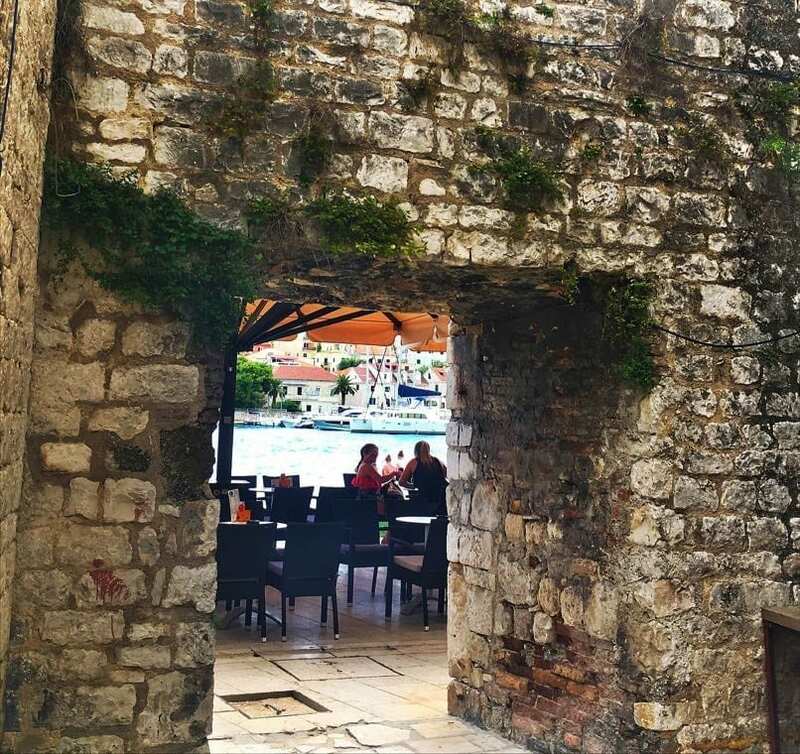 From the waterfront, you enter the old town through a picturesque arch. 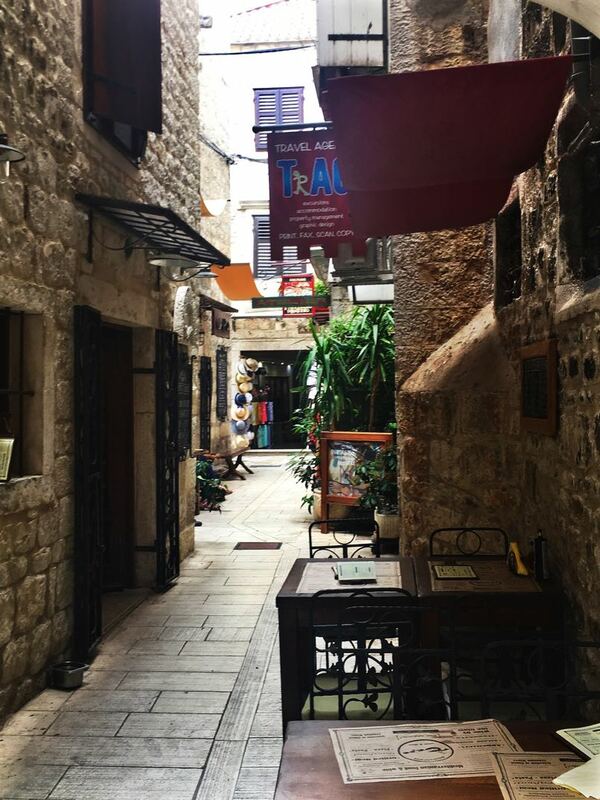 We enjoyed exploring the maze of interconnecting limestone-clad streets and alleys. We have no plan we just wander around. It’s such a small town that you could walk through from one end to the other in about 15 minutes, without stopping, although we went around and then went back after lunch and found even more that we had missed the first time. 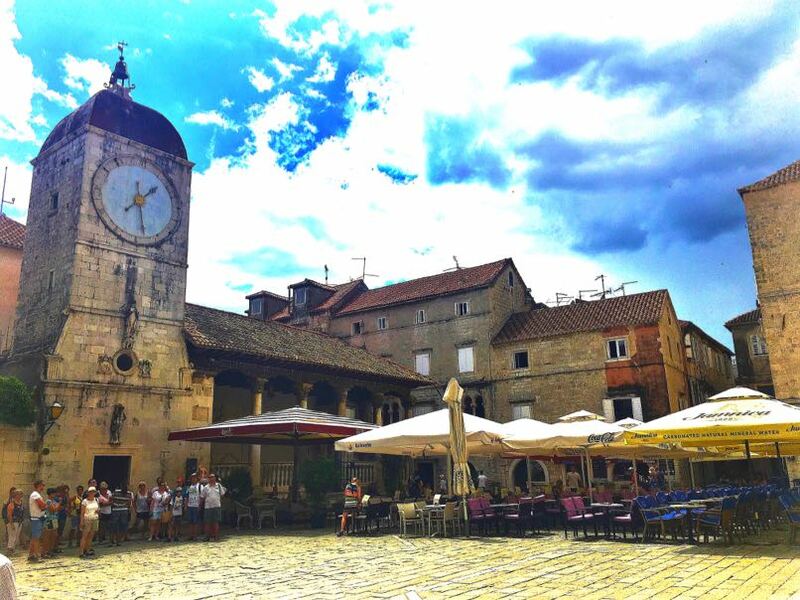 Yes, it is touristy with a number of bars, ice-cream shops, restaurants, souvenir shops and quite a few clothes shops but at the same time, the beautiful architecture is something to enjoy. 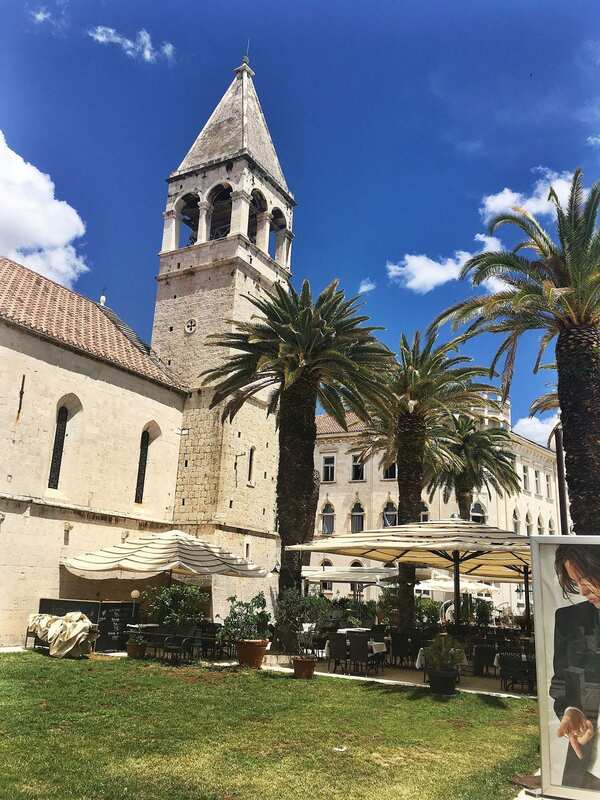 Eventually, you reach Trogir’s main square which is filled with historic buildings and the tall eye-catching bell tower of St Lawrence’s cathedral. It took more than 200 years to build this Roman Catholic Church and incorporates Gothic, Venitian Gothic and Renaissance architecture. You can visit the inside of the church and climb to the top of the bell tower if you don’t mind heights. We stopped for a coffee in this square to listen to the local folklore group “klappo” singing Capella. 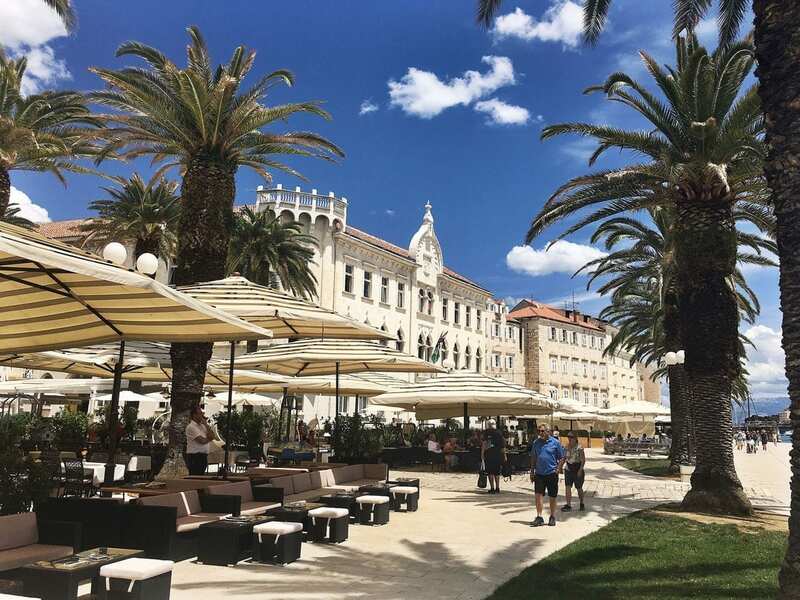 If you approach Trogir by bus then about 100 meters from the bus station you will find the Local Farmers Market which is across the bridge to the Old Town. 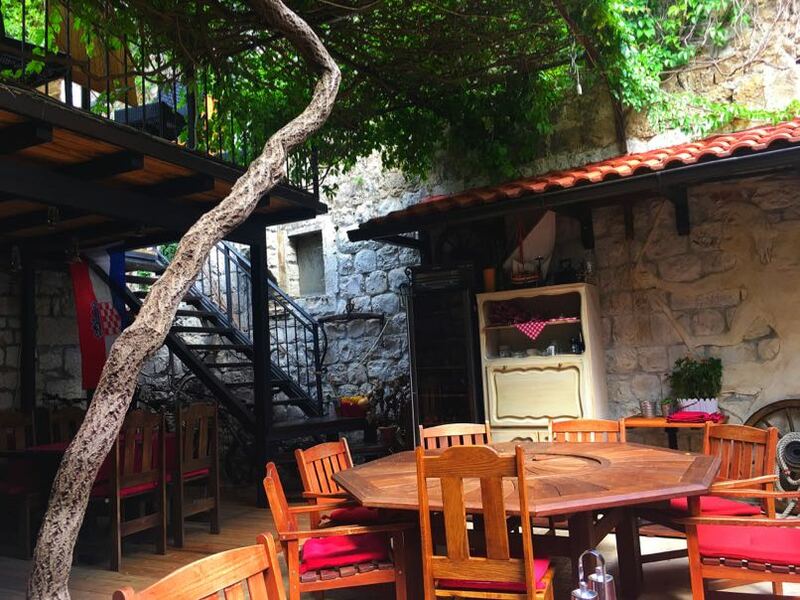 Here you can find fresh fruits and vegetables as well as locally produced olive oil. Also within the market are meat shops and bakeries that are a bit cheaper than the supermarkets. There are souvenir booths that sell handmade goods and a few snack bars and toilets. Split airport – 3km. 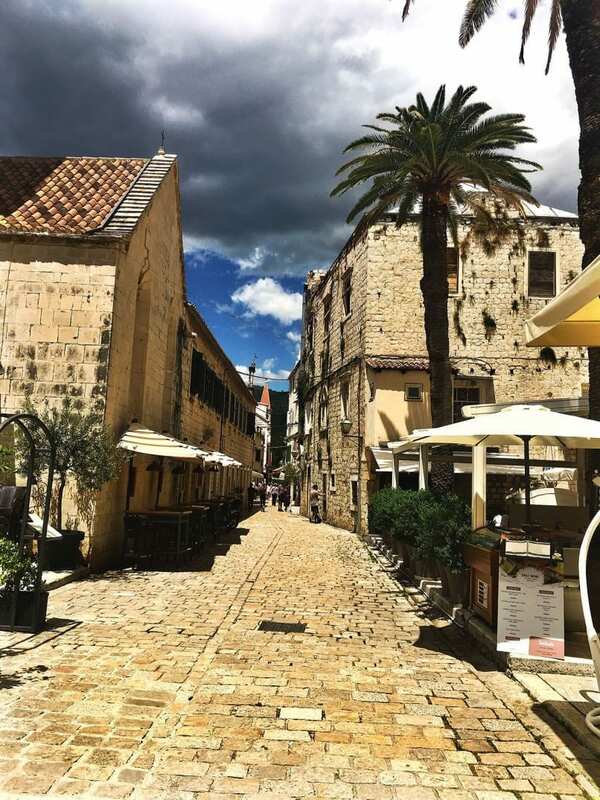 There is a direct bus from the airport to Trogir bus station local bus line 37 which stops on the road outside the airport. i.e. not outside the terminal building. The journey time is 10 mins. 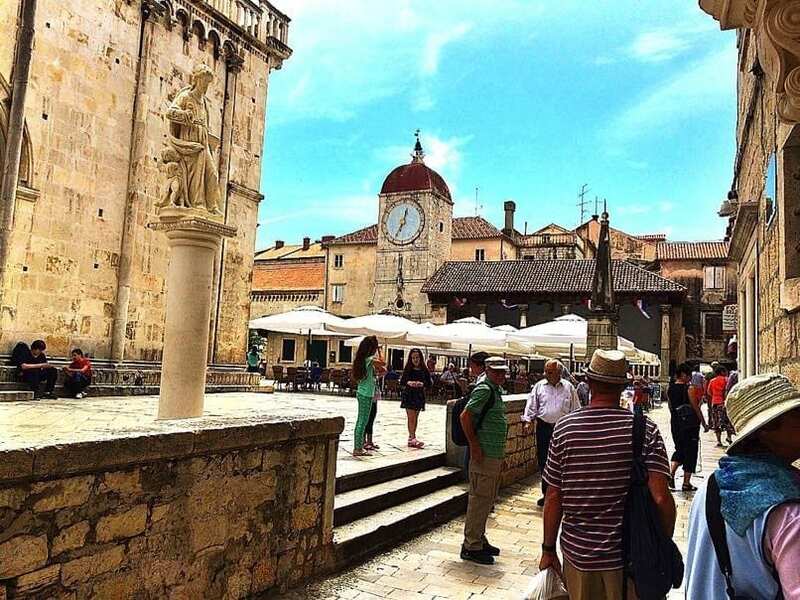 If you arrive at Trogir by bus the Old town is a 3-minute walk from the bus station. Buses run every 30 minutes to an hour depending on the day to/from both Zadar & Split. 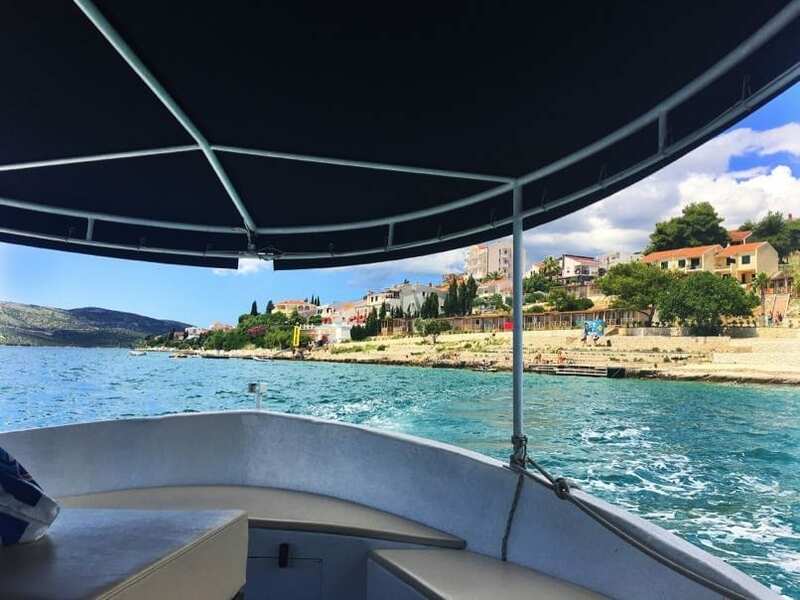 You can also get a regular Blu ferry to Split for 30 kunas each way. And I believe the ferry leaves from the promenade to other small islands. Distance to Plitvice Lakes National Park – 2 h 14 min (213.9 km) via E71 Cars will find it a bit busy as it’s on the main crossroads linking the mainland to the peninsula and they haven’t finished the new bridge yet. We visited a couple of years ago and stayed at the campsite on Ciovo. The road was very narrow and very busy with no passing. May and September are probably the best times to visit as its slightly cooler weather and fewer people. June, July and August are likely to be hot with a lot of tourists. In the old town, there are some small family run hotels. There are some 2 star and 3-star hotels and one 4 star hotel. The town also offers many apartments to rent. 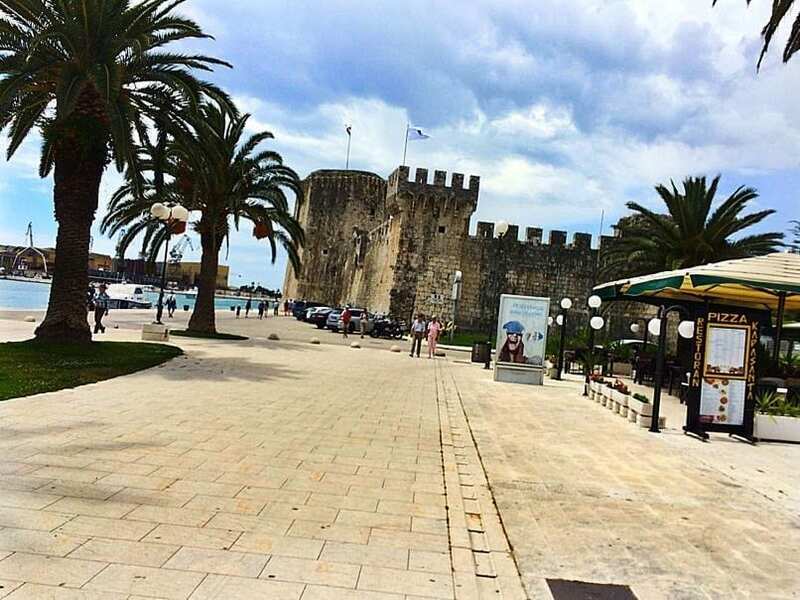 You can also stay on the island of Ciovo just across the bridge from Trogir old town. 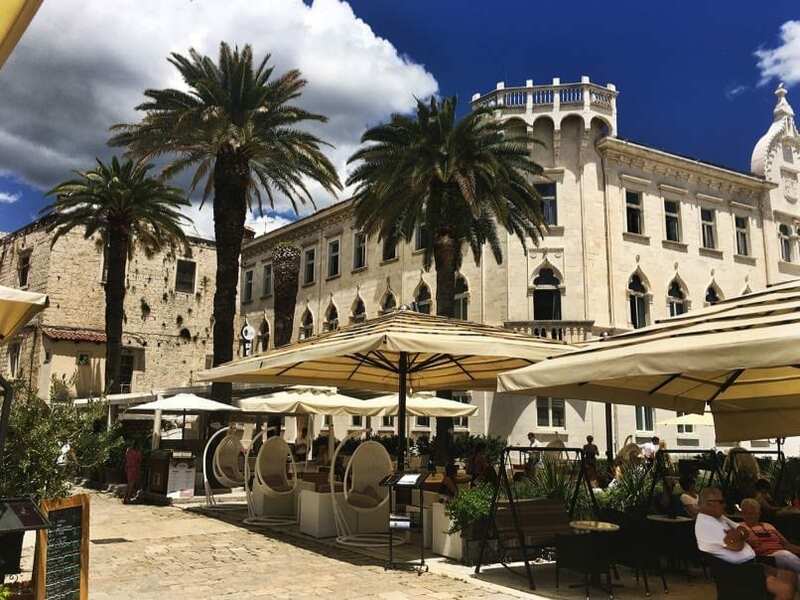 A really lovely family run hotel that we noticed is the Trogir Palace. 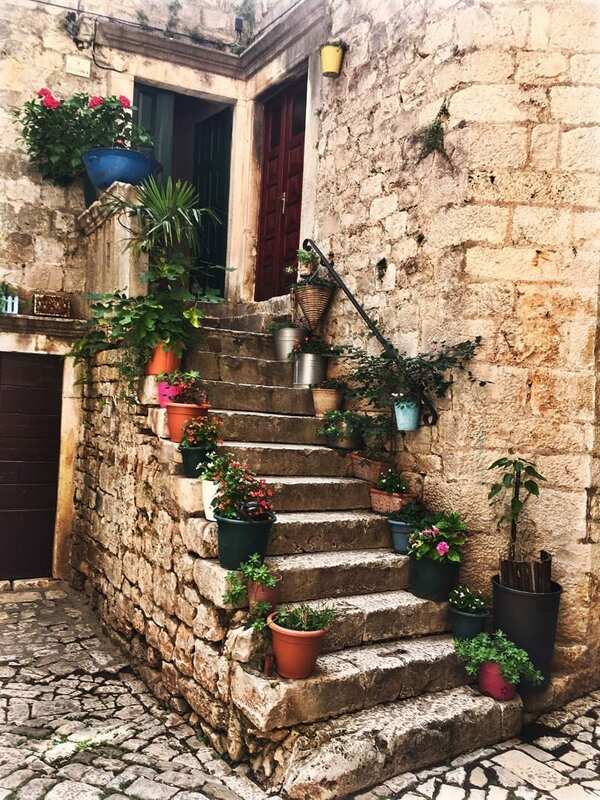 It’s a small friendly hotel with beautiful views over the harbour and is just a short walk from the centre of Trogir. The rooms are clean, comfortable and spacious. The staff speak good English and the breakfast buffet is nice. The terrace looks great to relax on with a glass of wine at the end of a busy day. There are a selection of small beaches scattered around the island so makes it ideal for a relaxing beach holiday with a bit of sightseeing. 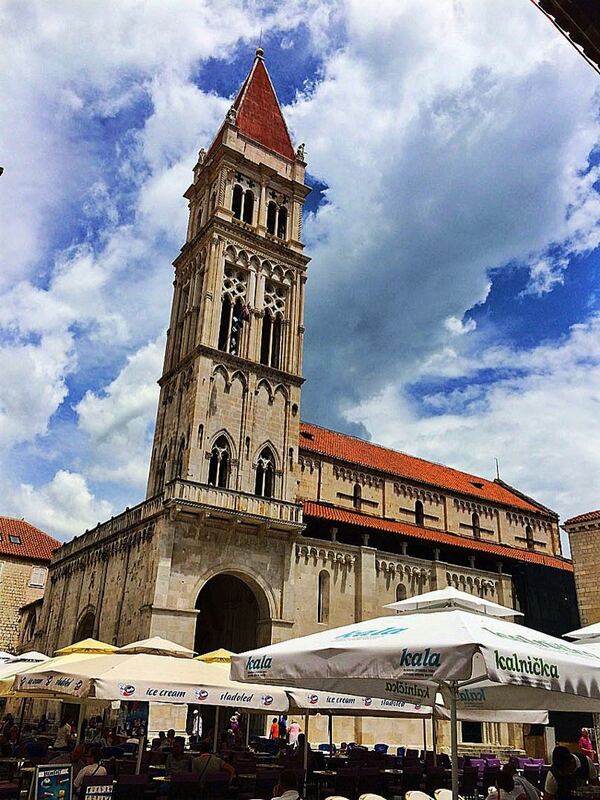 Not far from Split airport so great for visiting the city of Split. We stayed at Campsite Belvedere which is a superb terraced campsite with views of the sea and islands. 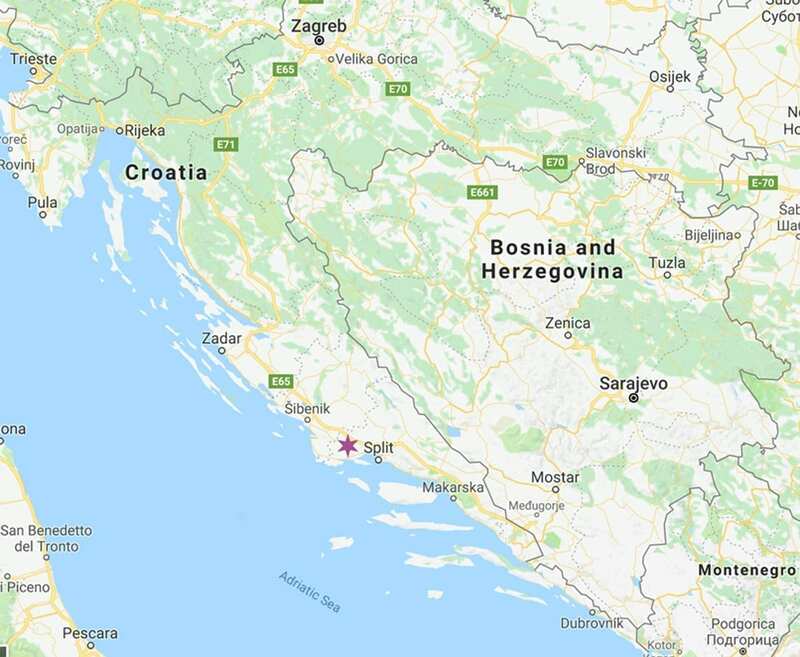 It was a bit further out from Trogir in Seget but there was a taxi boat that went into Trogir every hour for 50 kuna return. We booked this site through the ACSI discount camping card. Other sites in the area are Camping Rozac which we stayed at a couple of years ago and Kamp Seget. Okrug Gornji beach is about 5 km from the centre of Trogir on the island of Ciovo It is one of the most popular beaches in the area. It is more than 2 km long. Here you can rent jet ski equipment for parasailing, windsurfing etc. There are restaurants and bars there that stay open throughout the night offering night time entertainment. 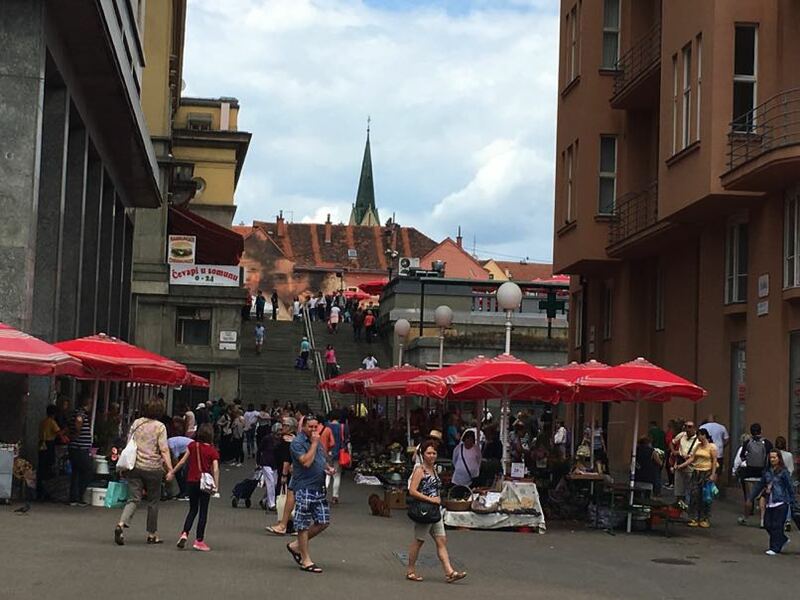 The Tourist Office is at Trg Ivana Pavla II. Br. 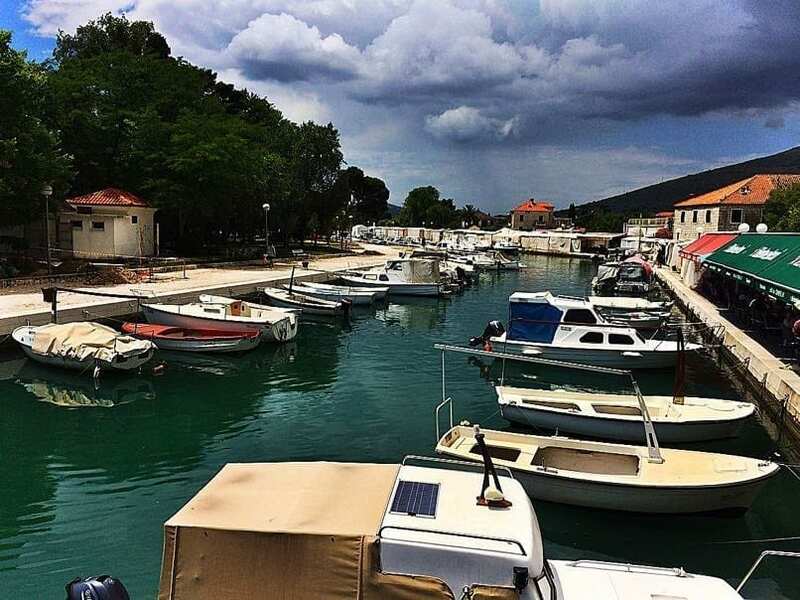 1, 21220 Trogir, Tel: 021 881 412 Fax: 021 881 412, Email: tzg-trogir@st.htnet.hr Trogir Tourist Office website. 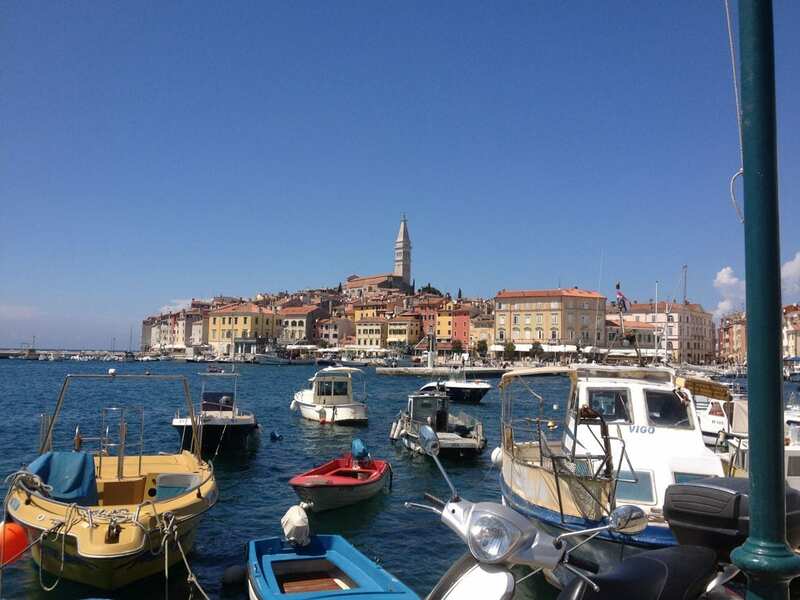 There are so many amazing places to visit in Croatia that we sometimes hire a car.